The official start of Spring is less than a month away but that doesn't mean that you have to wait a second longer to break out the boho babe inside you. One of my favorite transitional items is a free flowing print maxi dress or skirt. Make it winter weather appropriate by adding a faux fur vest or leather jacket and when the weather warms up wear pair your boho dress simply with gladiator sandals. The easiest way to master bohemian style in any weather is to shop Free People - one buying spree and you will look like a Coachella queen. But of course if you feel like being a bit more creative, you can easily winterize your flowy boho dress or printed maxi skirt with a little leather jacket. And don't forget to accessorize! Key boho accessories include fringe bags, tough boots, floppy fedoras. 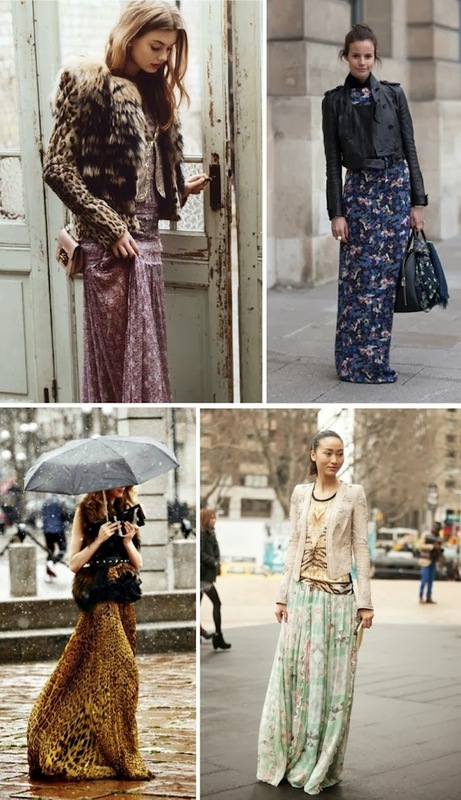 I really can't wait to be in my maxis.....and these boho looks are making me all the more excited and inspired!!! In the street, you always can see some beautiful dressing style. Sometimes you may find out the fashion trend of this season. I love those outfits, the flower pattern is very charming. Look at the second and third pictures, I really love these styles. The last one is beautiful too. Stylish style, women' s best love.